HEALTH MINISTER SIMON Harris has asked the HSE to introduce HPV testing as the primary screening method for the prevention of cervical cancer “as soon as possible”. The roll out of the new cervical cancer test has been held up by the backlog in smear tests, an Oireachtas Committee has heard today. Fianna Fáil health spokesman Stephen Donnelly asked when HPV testing, which is more accurate than current smear exams, will be introduced. Harris promised it would be introduced in September last year. This was then pushed out to January 2019. Today, Anne O’Connor, interim director general of the HSE, said she was unable to give a date for the new regime. The committee was told the backlog in smear tests would have to be sorted out before the new test could be provided. 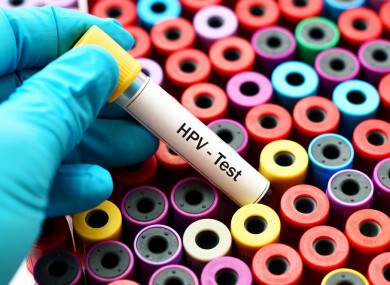 A spokesperson for the minister said the HPV test is a more accurate testing mechanism than liquid-based cytology, which is the current testing mechanism, and its use will result in fewer false negative results, though it will not eliminate them completely. Its introduction is in line with developments in cervical screening internationally. There is no doubt that the issues which emerged last year have resulted in operational challenges for the HSE and the Screening Service, and that stabilisation of the programme in 2019 is an important element in supporting the switch to HPV testing. Accordingly, the HSE is working very actively to manage these challenges while progressing this major development as a priority. Funding to implement the switch to HPV screening has been allocated in Budget 2019. The Department of Health is continuing to work intensively with the HSE on this matter. The health committee was also told today that there are 78,000 slides left in the CervicalCheck smear backlog. HSE officials said that no start date has been committed to for the new HPV test, and it would take at least nine months to sign a contract with the service provider who will undertake and review the tests. Taoiseach Leo Varadkar was asked about why the promise was being rolled back on. He said the government is “absolutely still committed” to the new test. Fianna Fáil leader Micheál Martin said that January has come and gone, and asked for a definitive timeline for the new test’s introduction. Varadkar said funding was allocated in the budget to roll out the test this year, but he added that laboratory capacity is a “key part” of the new service roll out. He added that when the new test will be introduced is dependent on contractual arrangements, which have yet to be signed. Having learned about committing to a specific date, seeing as the last two have been missed, the Taoiseach said it would be wrong to give a date that he cannot stand over. Following the recommendation from the National Screening Service, the minister approved a switch to HPV testing.The HPV screening test was described by the previous HSE boss Tony O’Brien as an “additional enhancement” in cervical cancer prevention, and will make the current smear test system “redundant”. The accuracy of HPV testing is significantly higher than the current liquid based cytology testing, and is expected to result in fewer women receiving a false negative result. What’s the difference between a smear test and the HPV test? The smear test detects abnormal cells that may develop into cancer if left untreated. HPV testing is used to look for the presence of HPV in cervical cells. These tests can detect HPV infections that cause cell abnormalities, sometimes even before cell abnormalities are evident. Like the smear test, the HPV test is done on a sample of cells collected from the cervix. Email “Harris asks HSE to introduce HPV testing 'as soon as possible' as roll out is pushed out due to smear test backlog”. Feedback on “Harris asks HSE to introduce HPV testing 'as soon as possible' as roll out is pushed out due to smear test backlog”.